We went to the mall ALL THE TIME in the 80s. ALL THE TIME. I hardly ever go to the mall now. That might be because I have two boys but I really think it’s because my body has a threshold for number of mall visits it can handle and I nearly reached it in the 80s. Seriously, though, in the 80s we were always there. My mom, me, my sister, my cousin and my aunt were at the mall a lot. It was an outing. We were shopping, eating and taking things back like nobody’s business. There was actually a time when there were no cell phones. Isn’t that hard to believe? I work part-time as a speech pathologist. One of the tests I give to assess a child’s ability to pronounce words correctly shows a picture of a telephone complete with a cradle and a cord and everything. Most kids say “phone” when they see the picture to which I have to reply, “Can you think of a longer word for that picture?” That’s the right answer, but we need them to say “telephone”. Many times a child just looks at me. They don’t know another word. They really never use the word “telephone”. One child even said “cell phone” yesterday. Can you believe that kid? I let him off being that he’s a first-grader and everything, but, goodness gracious, that ain’t no cell phone, son. The cell phone life, though, has been a part of us for quite some time. I’m not sure how long they had been out when Lil’ Troy said “I switched from Motorola to a PrimeCo phone” in his 1999 rap song “I Wanna Be A Baller”. I remember that line really well, because I had a PrimeCo phone at one time, the rappers were from Houston (my hometown) and he sang about an “Impala” and being a “shot call-a” in a way that made me want to repeat it at least 5 times a day. Or possibly 80. I can still remember my boyfriend at the time (husband now) giving PrimeCo a piece of his mind at a mall in Austin, Texas. We were at UT-Austin at the time. That PrimeCo had done messed up. No matter what ol’ PC had done, though, having one of those suckers at the mall back in the 80s would have been just really awesome. Remember mall life in the 80s? The pre-cell phone days? 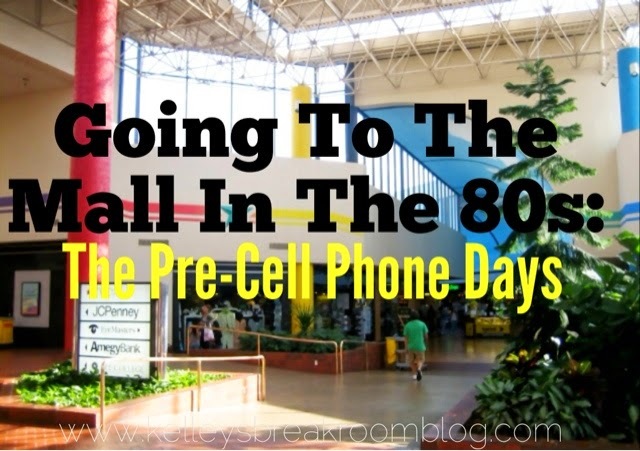 This is how the mall in the 80s went for us below. This particular story is made up, but, trust me, variations of it happened all the time. Within seconds, I would have been submerged in the sea of book scent and wouldn’t want to leave. There were just so many good books. I would have counted my money, found the latest Babysitter’s Club book, checked out the Sweet Valley High books and then possibly would have bought both…and possibly that book over there, too. I was a busy girl. I had no time for clock watching. And, BAM, just like that, it would have been 2:30. I had to get my behind in front of Foley’s pronto. I would have arrived covered in sweat frantically looking around for my mom who I would expect to be frantically searching for me. But, she wouldn’t be there. When I made it to our meeting spot before the other person, I always felt good about myself. I felt a tad bit more on top of the world. I was a responsible human being, no matter how many things I had lost in my lifetime and then found again a while later. I would have kept sitting there, though, while thinking, thinking, thinking about where she could be now. Maybe she was at the OTHER entrance to Foley’s. Or maybe she would have been at Casual Corner. I bet I could go check at Casual Corner and there she’d be. I was just going to go check at Casual Corner really fast and see if she was there. It was just a few stores down around the corner and to the left. I’d walk fast, just in case she wasn’t at Casual Corner and she had come back to wait for me outside of Foley’s, like she had said. Out of breath, I would have stopped in front of Casual Corner and poked my head inside. My mother wouldn’t have bern around, though. Not where I could see her, anyway. That didn’t mean she wouldn’t be in the dressing room, which means I’d have to go play the fun game of Hang-Your-Head-Upside-Down-To-Look-For-Shoes-Under-The-Stall game, which ended up revealing nothing. DANG IT. SHE’S SURELY OUTSIDE OF FOLEY’S BY NOW. Hurrying back to Foley’s meant that I had missed my mom headed to Waldenbooks to look for me. “I told Kelley to meet me outside of Foley’s!”, she would have been muttering to herself. She would have found herself going up and down the aisles of Waldenbooks looking for my dark hair plunged inside a book, but wouldn’t have found anyone. Meanwhile, I’m at Foley’s again, only know it’s 2:50, which makes me realize she’s not coming. She’s not there. She’s not at Casual Corner. She must be at Mervyn’s. She must have forgotten that we were going to meet and is at Mervyn’s. Maybe she would have been waiting for the clerk to look up a price for something. Maybe the clerk would have been sitting there with a rotary phone receiver glued to her ear because my mom asked her to check on the price of something. “I’m pretty sure those slippers are $5, not $5.99,” she would have just told her. That’s what I would have visualized, but when I would have checked, I would have found out that she wasn’t at Mervyn’s. Nor that little stand alone Pepperidge Farm establishment. And, I wouldn’t have been at the places she would have checked. Not at the token mall pet store. Sooner or later (usually later), we’d wind up at the meeting spot somehow at the same time where I would have heard “Where were you?” and “I told you that we were meeting right here” and countless variations of the two to which I would have countered back with “I was” and “I know” and, eventually (most of the time), an apology. The stress. Just think of the stress of all of that, young folks of today. You don’t have to worry about losing anyone ever at the mall, as long as you both have charged up cell phones. My generation had it tough, didn’t we? And every generation before that that went to the mall. Maybe the people of my generation didn’t have to walk many miles in the snow without shoes to get to school, but, by golly, we had to look for people in the mall without cell phones!